No matter how much or how little you’re being paid at work, there comes a time for everyone when they feel it’s not enough. You may have been pleased with the salary you negotiated for yourself when you received your job offer, but now you want more. Maybe you’ve gained extra qualifications, taken on more responsibilities, or simply could use some extra cash. For many, talking about money isn’t something they’re comfortable with, and asking for more can feel a little awkward. 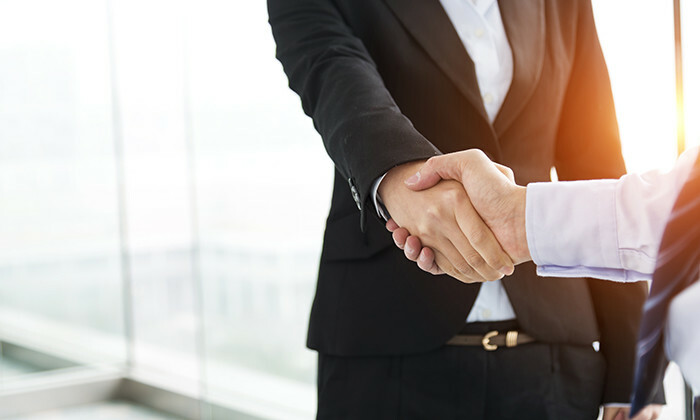 So when you finally do decide it’s time to negotiate, here are four tips to help increase your chances of getting that raise, courtesy of Payscale. 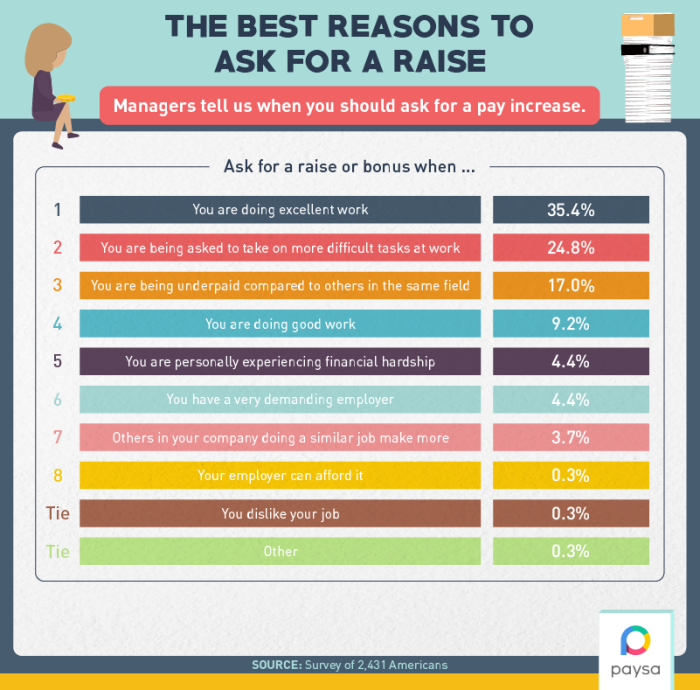 The team at Payscale asked over 2,400 US managers about acceptable reasons for staff to request a raise. Unsurprisingly, the top reason cited is performance related, with 35.4% of respondents saying “doing excellent work” could be grounds for a pay increase. Asking because you feel your employer can afford it or because they’re particularly demanding is less likely to lead to success. While persistence can be an admirable quality, negotiating a raise isn’t a matter of wearing your manager down. Simply asking more often won’t increase your chances, and could potentially do the opposite. So how often is too often? 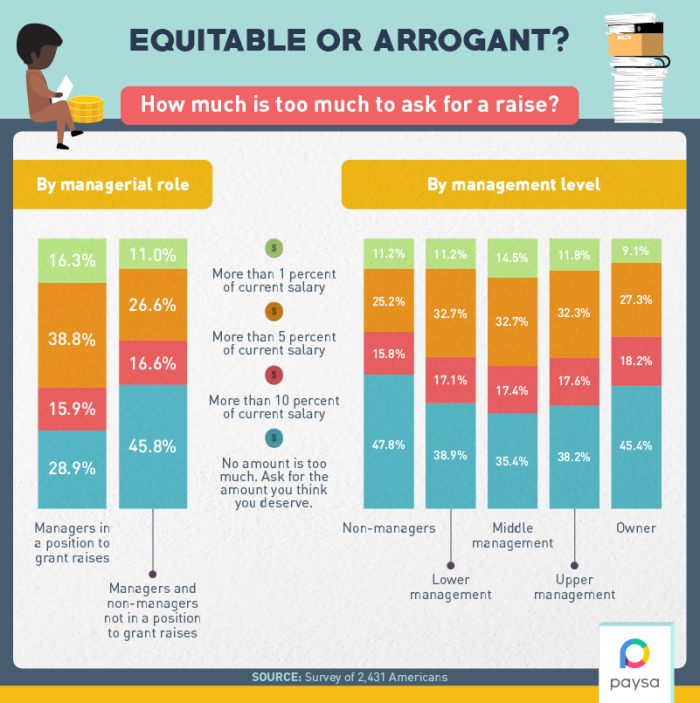 More than once a year, say over half (59%) of Payscale’s respondents. If you ask once every two years, you might still be pushing your luck, with 26% indicating that’s too often. Interestingly, nearly 3% of respondents feel asking more than once every six years is unacceptable, and a few (0.7%) even said one every eight years is too much. If you suspect your manager falls into this category, perhaps it’s time to start looking elsewhere. If you’re convinced you can present a strong case as to why you deserve a raise, you should be able to indicate exactly how much it should be. Sitting down for a negotiation with your manager without a number in mind isn’t going to result in a productive discussion. Yet for many people, deciding how much to ask for is the trickiest part, as they worry asking for too much will set them up for failure, or worse. The survey shows there’s some truth to this, with 38.8% of managers with decision making power saying more than 5% of your current salary is too big of an increase to ask for. 16.3% felt that even more than a 1% increase was out of line. 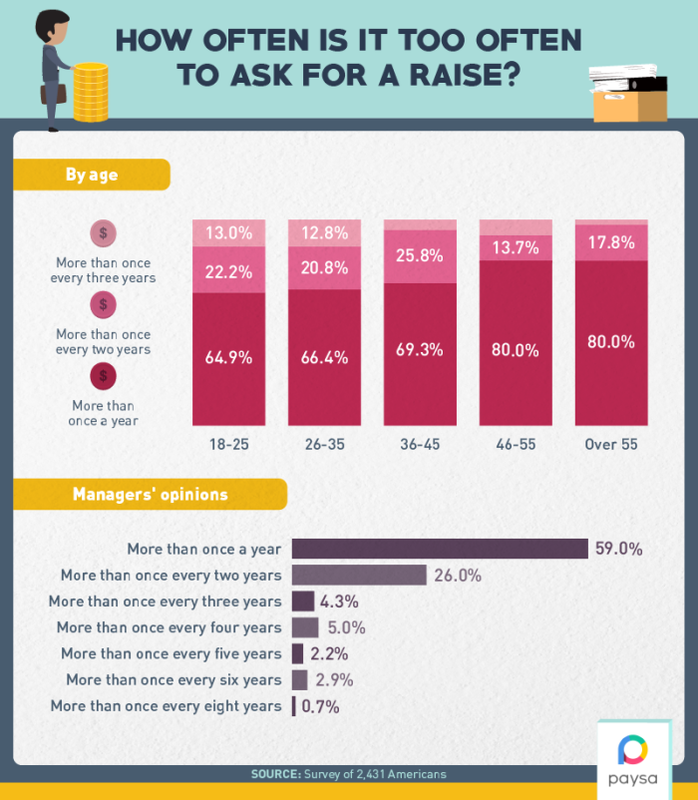 On the upside, depending on their positions and roles within the company, 28.9% to 47.8% said that you should simply ask for the amount you think you deserve. In the world of business, you have to go after what you want. While more and more companies are focusing on improving their employee experience, at the end of the day it’s the annual results that matter most. Companies are offering smaller annual pay increases to cut costs, and getting a raise with your promotion isn’t as common as you’d expect. So instead of waiting around each year hoping for a pay raise to materialise out of thin air, you’re gonna have to ask. Mukta Arya, Societe Generale's HR Head, said: "We recognise the dual roles many of our female employees play and we want them to s.. There have been several moves in the cost of living rankings across the globe over the last 12 months, driven mostly by exchange r..